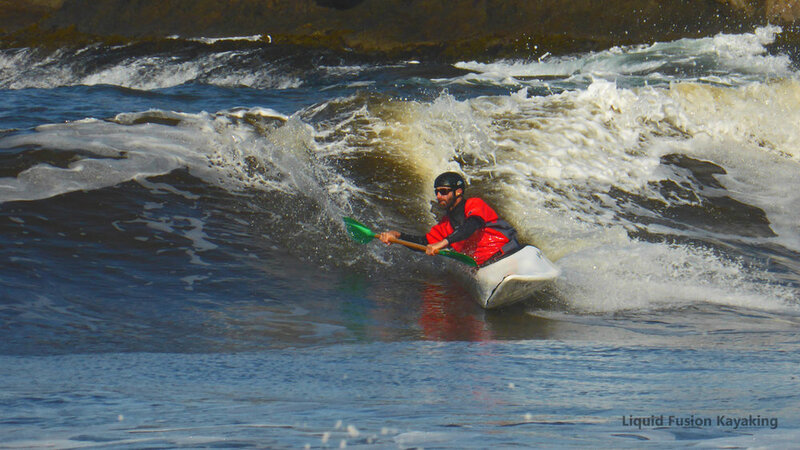 Learn performance surfing techniques to have more fun with whitewater kayaks, high performance surf kayaks, and waveskis. LFK's Jeff and Cate are avid kayak surfers and skillful coaches for all levels of paddlers looking to improve their surf skills. Contact us about setting up a custom surf lesson or safari for 1-4 paddlers or check our calendar to join us in one of our surf kayak classes. Use the chart to assist us with deciding how to design your adventure. Recreational (Level 1): Learning to utilize essential kayaking skills in the surf. We practice in a friendly environment as we introduce the surf zone, etiquette, launching, landing, wave selection, and wave sliding. Paddlers at this level can expect to experience the thrill of riding a kayak in the surf. February 23-24, 2019 and by appointment. Enthusiast (Level 2): Become picky about your wave selection and start maneuvering your boat on the wave, skillfully exiting the wave, and rolling in the surf. February 23-24, 2019 and by appointment. Performance (Level 3): Paddlers at this level know how to surf waves and are working on developing dynamic maneuvers on the wave and advanced techniques for dropping in and exiting the wave. March 9-10, 2019 and by appointment. 3 HOUR, MULTIDAY LESSONS, AND SURF SAFARIS AVAILABLE FOR 1-4 PADDLERS. Kayak Surfing Puts a Smile on Your Face!! !